Gary Hume’s exhibition The Indifferent Owl is as slick and polished as one might expect from an artist who paints with gloss paint and exhibits at White Cube, but for me, though I generally like Hume’s work a lot, there is something missing. Quite what that something is I don’t know but maybe it’s the indifference in the exhibition’s title seeping out and affecting the way I see the work. The exhibition runs over two spaces – Hoxton Square and Mason’s Yard – which means there’s a fair bit of work on show. I saw the Mason’s Yard exhibition first, which meant that at least the Indifferent Owl was more than an exhibition title to me from the start. The painting Bad Tooth, also at Mason’s Yard, at least made me smile, but that small moment of amusement aside the exhibition really didn’t work for me. There are lots of things that work as well as ever in terms of Hume’s use of household gloss paint in which we see our own image reflected; in my case the reflection is as indifferent as the owl. It all feels a bit too smooth and superficial. Beneath its glossy surface, the work lacks substance. More worryingly, when something more than what we first see is suggested, on the whole I find myself rather wishing it wasn’t. 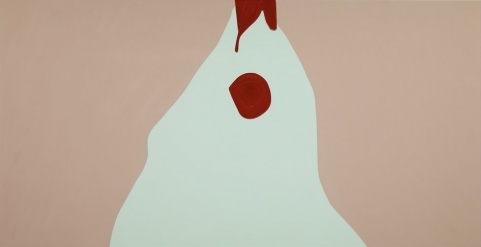 According to White Cube, the Paradise Paintings ‘depict the heads of birds, each with a beak and an eye of deep, visceral red. While the ‘Paradise Paintings’ are recognisably pictures of birds, the forms also suggest fragmented figures.’ In the context, it’s easy to read the paintings as birds, but the flesh tone of the background is ambiguous and opens up alternative, bodily, readings. On the whole, I find myself rather wishing it didn’t. 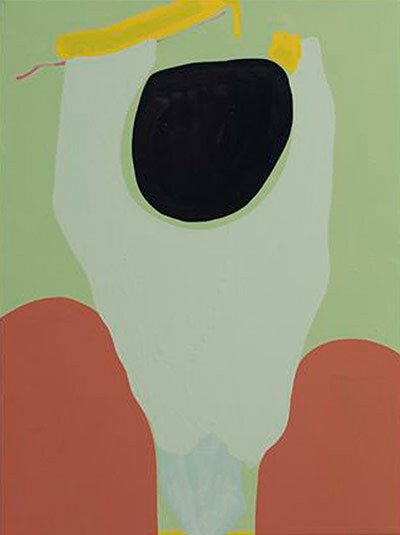 Gary Hume: The Indifferent Owl is at White Cube Mason’s Yard and Hoxton Square until 25 February 2012. This entry was posted in Painting and tagged art, Bad Tooth, Gary Hume, Indifferent Owl, painting, Paradise Paintings, White Cube by Ann Jones. Bookmark the permalink.